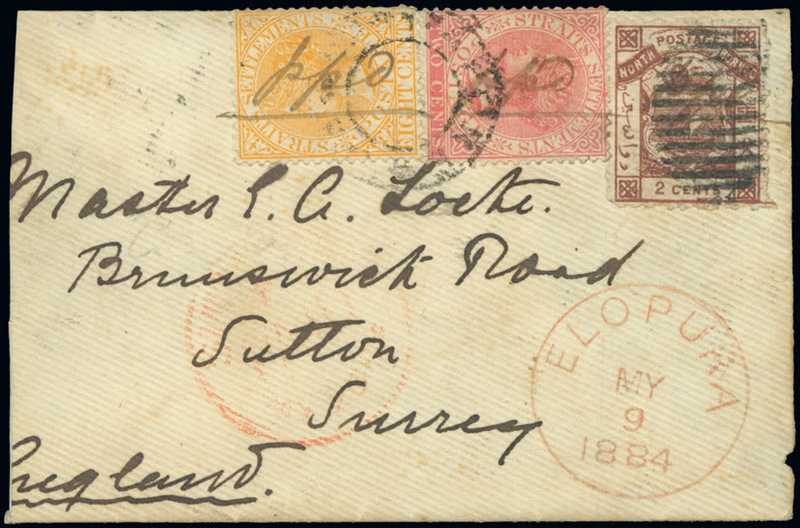 This auction featured the Stewart R. Murray North Borneo, an outstanding collection that included an 1884 combination envelope from the ‘Locke’ correspondence to Surrey bearing the 1883 2c. brown used with Straits Settlements 1882 8c. orange and 1883-91 2c. pale rose (lot 995). In spite of some foreshortening and imperfections this attractive item, featured on the front cover of the sale catalogue, achieved a price of £9,520. Among other notable prices, the 1899 4c. on 12c. 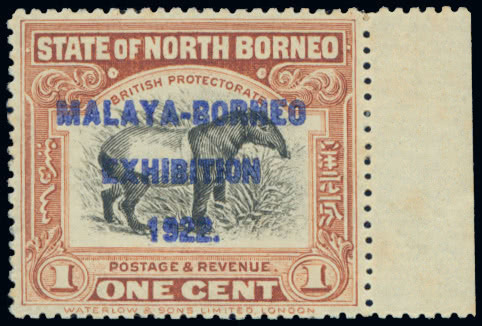 imperforate between pair (lot 913, S.G. 115a) reached £665, the 1922 “MALAYA-BORNEO/EXHIBITION” 1c. 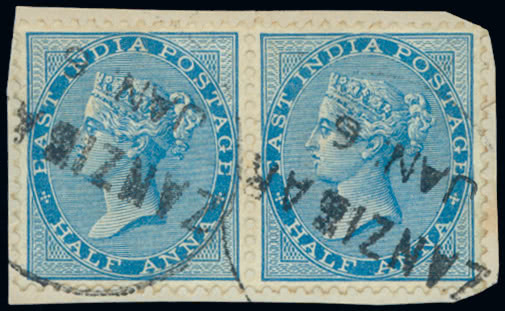 overprinted in blue (lot 956, S.G. 253g, above) rose to £1,048, whilst the unlisted imperforate between variety of the 1894 Pictorial 3c. (lot 894, S.G. 70 var.) soared to £895. The sale was otherwise notable for the presence of a number of sections of material rarely presented in significant numbers or quality in major auctions. The ‘Saisunee’ collection of Gilbert & Ellice Islands offered a range of covers showing scarce island cancellations and unusual destinations. 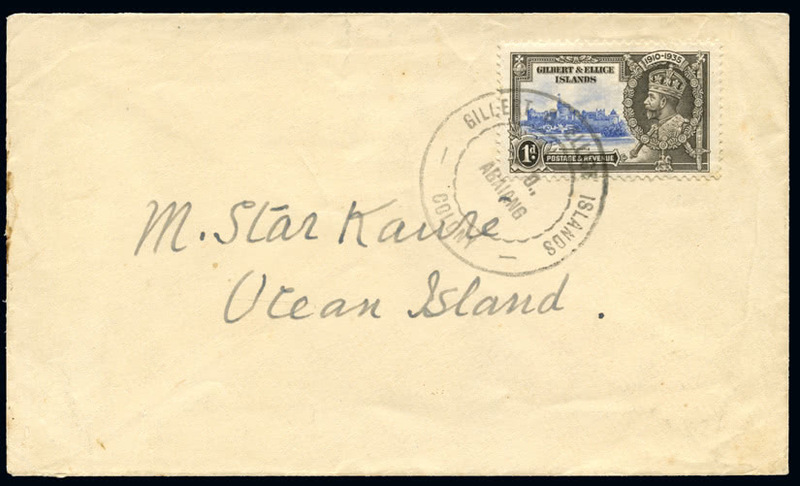 An undated envelope from Abaiang to the Government interpreter on Ocean Island (lot 545) with Vernon type 9 handstamp was a popular item at £491. 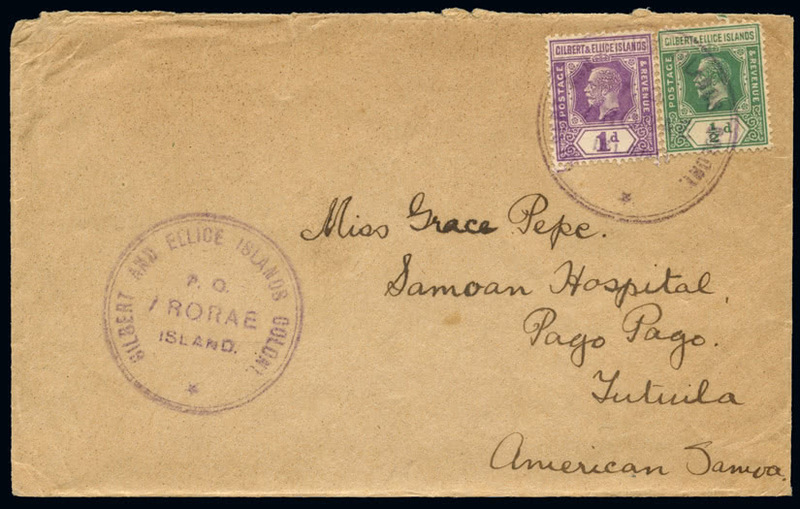 Another from Arorae to the Samoan Hospital in Pago Pago, American Samoa with the scarce type 11 handstamp (lot 553) achieved £430. A strong section of lots from Fiji was well supported by international bidding. The total of £921 paid for the 1899 6d. 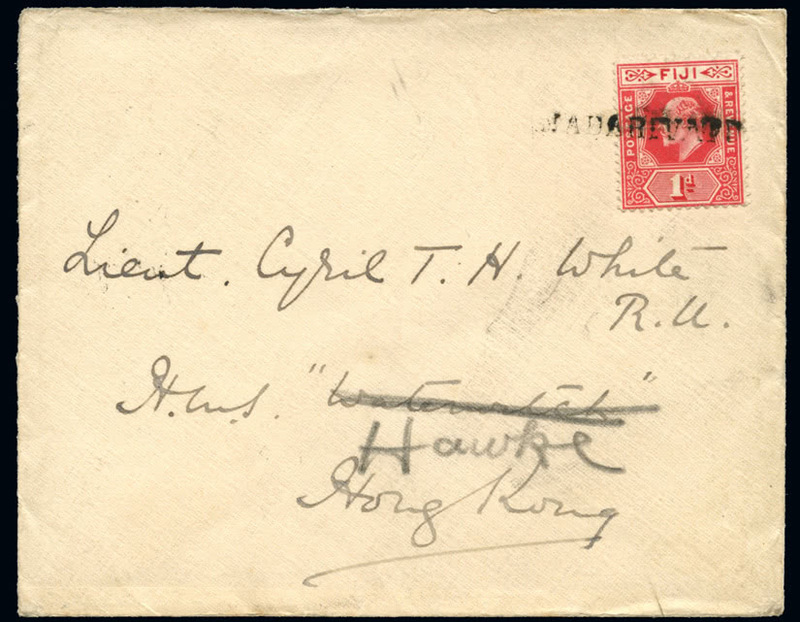 dull rose with printed both sides variety (lot 436) was perhaps predictable but other prices were strong and reassuring, including the £430 paid for the 1912 Government House envelope (lot 457) addressed to Lieutenant T.H. White on the HMS Waterwitch at Hong Kong (redirected to the HMS Hawke) and showing the “NADARIVATU” straight line cancellation. The exceptional collection of Trieste formed by the late Dr Ronnie Shiers, presented mainly as a series of interesting groups of material, was less popular overall whilst still achieving strong prices on individual lots. A collection of early entires from 1767 to 1856 (lot 1288, estimate £150-200) realised £500. The auction was brought to an inspiring conclusion by the fine collection of India used in Zanzibar formed by Jeremy Lea of the East Africa Study Circle. 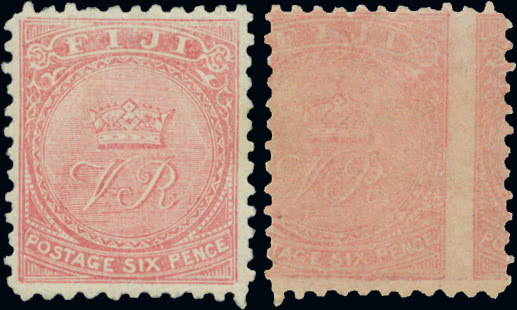 High levels in relation to catalogue values were achieved for many lots, with two shades of the 1867-73 “Service” overprint 2a. 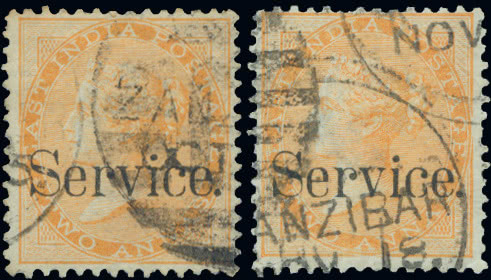 orange cancelled by the type Z3 duplex (lot 1421, S.G. Z35, cat. value £700) reached £571 in spite of a few pulled perforations, and a pair of the 1865 1/2a. 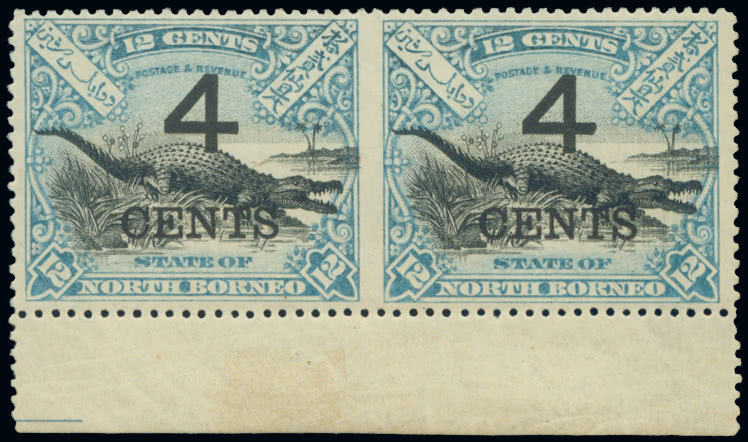 blue with type Z1 cancellations (lot 1398, cat. value £550, left) rose to £738.